Today, 2 Nisan, is the 87th yahrzeit of the fifth Lubavitcher Rebbe, Rabbi Shalom Dov Ber Schneersohn, known as the Rebbe Rashab. The fifth Lubavitcher Rebbe, Rebbe Shalom Dov Ber Schneersohn ("Rashab"), was born in the White Russian town of Lubavitch in 1860. After the passing of his father, Rebbe Shmuel [the Maharash] (in 1882), he assumed the leadership of Chabad-Lubavitch. Famed for his phenomenal mind and analytical treatment of Chabad Chassidus, Rabbi Shalom Dov Ber wrote and delivered some 2,000 ma'amarim (Chassidic discourses) over the 38 years of his leadership. In 1897, he established the Tomchei Tmimim yeshiva, the first institution of Jewish learning to combine the study of the "body" of Torah (Talmudic and legal studies) with its mystical "soul" (the teachings of Chassidus); it was this unique yeshiva that produced the army of learned, inspired and devoted Chassidim who, in the decades to come, would literally give their lives to keep Judaism alive under Soviet rule. In 1915, Rabbi Shalom Dov Ber was forced to flee Lubavitch from the advancing WWI front and relocated to the Russian city of Rostov-on-Don. In his final years, he began the heroic battle against the new Communist regime's efforts to destroy the Jewish faith throughout the Soviet Union. 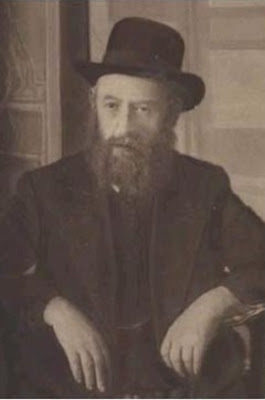 Rabbi Shalom DovBer passed away in Rostov on the 2nd of Nissan, 1920. His last words were: "I'm going to heaven; I leave you the writings." * Song reveals the beauty within the soul. * Once at a Lubavitch farbrenghen [gathering], a group of talmidim from the Rashab’s yeshiva, Tomchei Tmimim, sang a known niggun in an imprecise manner. The Rashab admonished them, noting that a niggun is a matter of beauty, which brings out the beauty of one’s soul, and precision in a niggun is the epitome of beauty. The Rashab would say that when our Sages tell us that we should say over in our Rebbe’s name, it does not only apply to a Dvar Torah or a minhag [custom]; but even to part of a niggun. One should give over a niggun with its original tahara [purity] and precision, including how and when it is to be sung. * A niggun must be learned, and it deepens you. * Chabad Chassidim often sang moving niggunim before go into a yechidus [private session] with their Rebbe. The Rebbe Rashab once heard how a Chassid sang a niggun, and the Chassid was very moved with a strong feeling for the Rebbe. The Rashab noted that the Chassid had relived his experience of yechidus with the Rebbe. * According to the teaching of the Arizal, it is a mitzva to sing on Shabbos. Shabbos is the time that all of the 'worlds' are elevated, which is accomplished through niggunim. A niggun causes a stirring in the soul, which is an elevation and a dveykus [attachment] to Above. We see this, when a person ponders on a certain [Torah] matter without a niggun, his pondering affects his soul, but it is hardly noticeable, for it is without liveliness or fervor. But when he sings aloud, during his pondering, the ascent of his soul is perceptible, for it is full of life and fervor. Niggun Hachana, sung before the Rebbe gave over his Chassidic Torah discourse. In Chabad’s Sefer HaNiggunim, Niggunim #17-19 are listed as from the Rebbe Rashab. They are his Nusach [chant tunes] for the pasukim [verses] recited before Tekias [blowing of the] Shofar, the blessings thereon, and the verses recited afterwards. You can find links to them on this page. I can believe it, since I'm convinced that the singing and dancing at NCSY events entered my neshamah and brought me to Torah uMitzvot.